Left: Sr2RuO4 Right: Sr3Ru2O7, both images made with VESTA. If you’re familiar with the perovskite (which regular readers should be by now), then you are familiar with one of the building blocks of Ruddlesden-Popper structures. The slightly complicated looking formula for this type of material is An-1A’2BnX3n+1. What this means is that this material has two types of cations, A and B atoms, with X being the anions in the system. Shown above are the cases for n = 1 (left) and n = 2 (right). All types of Ruddlesden-Popper structures share same basic layout: in the middle of the unit cell is a perovskite layer, where an ABX3 structure forms. 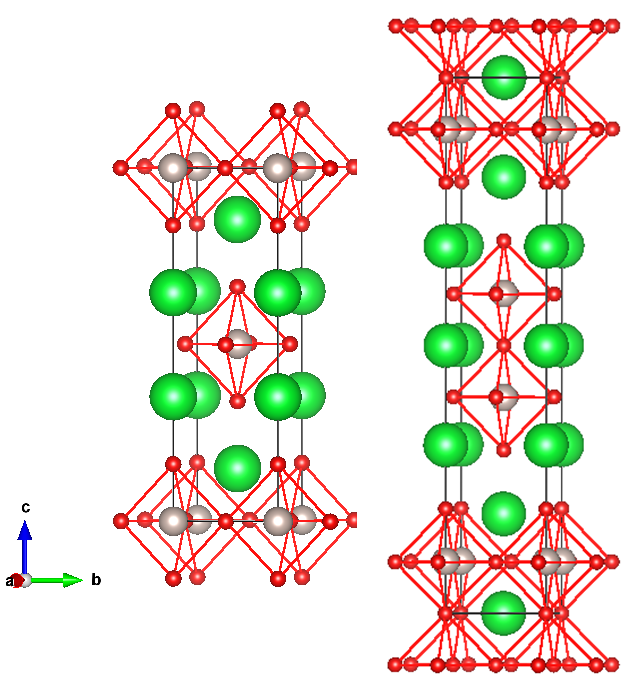 Above and below that is a layer comprised of B cations surrounded by X octahedral. The A’ cations appear between at the boundary of the two types of layers. But this series of structures extends beyond n = 2, although making those materials can be quite the challenge! However, research groups that specialize in thin film growth, such as those from Cornell University or Argonne National Lab have recently been able to fabricate a variety of Ruddlesden-Popper samples. As you may have guessed from the name of these structures, they were first synthesized and described by S.N. Ruddlesden and P. Popper, with the n = 1 structure (left) published in 1957 and the n = 2 (right) following a year later in 1958.